Several thousand people departed the first annual Flyover show on Saturday night in the two hours before headliner Gucci Mane took the stage. Ominous storm clouds began to peer over the outdoor concert shortly after it began and had relieved hip-hop fans that had been tormented by the sun all afternoon. In the end, the storm from those clouds forced many to hit the road. It was around 11:30 P.M. when Atlanta's recently exonerated Trap God took the stage to perform a 30 minute set for those who stuck it out -- and those watching from the venue's Facebook live stream. Gucci's laid back delivery and powerful presence seemed to be in full effect. 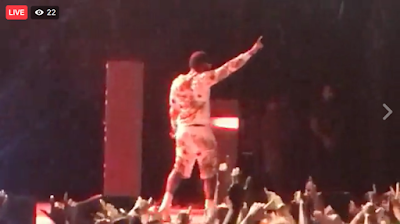 It's nothing out of the ordinary for a performer to sprinkle light praise on their crowd, but the tone in his voice when Gucci mentioned how glad he was to finally be performing seemed immensely sincere. His set provided a smorgasbord of songs from his decade-long discography. Fans were treated to old school tracks from "Hard To Kill" and "The State vs. Radric Davis," along with cuts from his post-prison albums, and recent features like "Slippery" and "Black Beatles" -- although Rae Sremmurd did not return to perform their half of the latter. If there's any lesson to be learned from this performance, it's that Gucci Mane is a man that beats the odds time and time again. Mississippi rap star brothers Rae Sremmurd brought high energy fun in their outing. Slim Jxmmi, who trotted out onto the stage in a monster mask, traded verses with Swae Lee as the two re-created tunes from both "SremmLife" albums (and teased the upcoming "SremmLife 3"). The two also seemed thrilled by the lightning approaching the venue and noted that the rain didn't bother them. The party vibes only grew as the set continued; Lee and Jxmmi invited a dozen fans onstage to dance with them, although a pushy pair of bodyguards kept them at a distance. A thunderous performance of their recent single "Swang" proved to be one of the evening's most Snapchat-worthy moments for the audience. 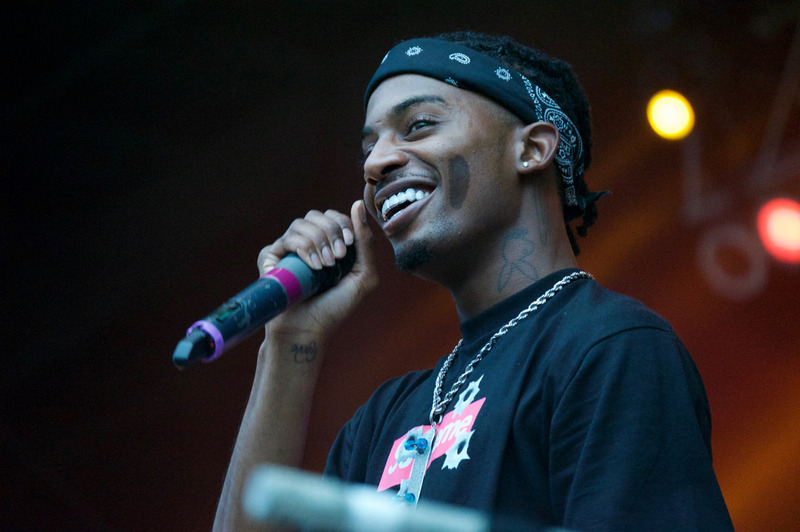 Lil Uzi Vert and Playboi Carti are two young stars who have been rising steadily over the past few years. Both, however, have had their highest-charting singles drop in 2017. In their joint set, the pair bounced across the stage and hyped each other up, although never engaging one another too closely. Carti was the first to emerge as the atmospheric album opener "Location" blasted from the PA. After Carti's mega-hit "Magnolia," Uzi joined in and the two performed their collaboration's from Carti's debut. 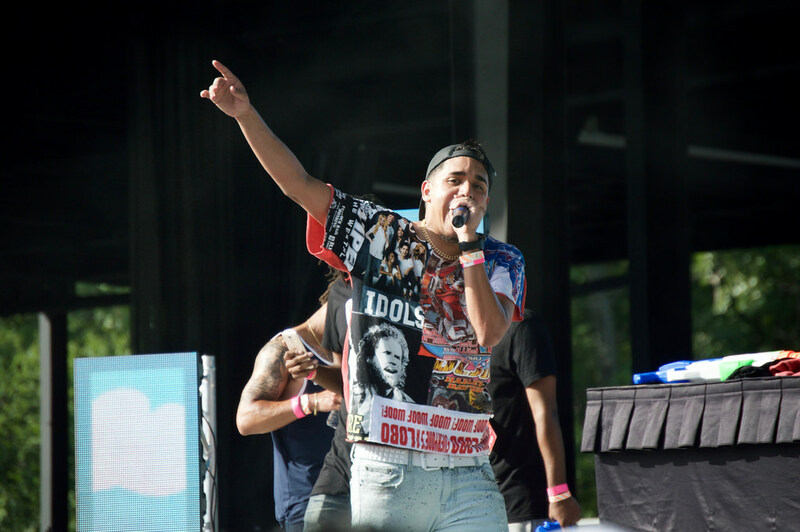 Uzi performed a few tracks before noting that he had recently lost his voice, explaining his lack of volume -- despite sounding fairly similar to his 2016 appearance where he didn't mention any vocal problems. Following a handful of hits from previous years, Uzi made it to "XO Tour Llife" where he climbed atop the DJ table and did his best to belt out his most recent chart-topper. Those listening closely heard him get every other word out, but the masses in general admission didn't mind at all. Those fans also flocked to see the Philadelphia firebrand briefly run down into the pit with them and climb atop a barricade during a song. The first touring act of the evening was Florida's Smokepurpp. The 20 year-old's grim energy was realized by everyone watching when he asked those in the pit to punch people in the mouth if they didn't participate. (His DJ quickly clarified that everyone should "be safe"). Many fans seemed overjoyed by the simple fact that Purpp was in their town, but his demands of crowd energy often felt hypocritical when he spent a portion of his time wandering the stage, unconcerned with his duties as a performer. His most popular song -- "Ski Mask" -- did manage to draw the first widespread moshpits of the day and a handful of other songs were received with enthusiasm. Rory Fresco was the last of the local openers to perform on Saturday afternoon. By the looks of things, Rory had mapped out a solid performance, but things quickly fell apart through no fault of his own. There was a timing error in his entrance to the stage and the song had to be restarted, catching him off guard. That song was followed by his breakout "Lowkey," but the audio began to crackle and the track was stopped within moments. Several minutes passed during this bout of technical difficulties. Eventually, Rory's new single "Involved" was cued up and it was quickly gaining steam until a stage manager pulled the plug on it, ending his set. Preceding Rory was his good friend SuperShaqGonzoe. The young rapper-producer put on the most successful set of the afternoon's local talent, despite a visible amount of fatigue. Party rap bangers like "Bounce" and "Vitamins" went off without a hitch and friends with Super Soakers mobbed the stage to help cool down the first few rows. AyEl's set brought polished modern R&B to the stage for the first and last time at the first Flyover. While the young singer/rapper avoided technical problems and showed a good deal of focus, his performance didn't manage to hold the attention of an audience mainly focused on securing more drinking water. Project Laing party mainstay Staxx ran into some laptop issues during his set, but marched on with the help of a couple live instrumentalists. The two original songs he ended up performing, however, acted as commercials, as he referenced his clothing brand extensively. He also made an ill-fated attempt at crowdsurfing by thrashing about and trying to move from the hands of one overheated rap fan to the next. Opening the show was Duncan Burnett, a local rapper, drummer, and advocate of Black Boy Joy. Burnett's performance was one of the day's strongest, but was cut to less than 10 minutes in hopes of evading the storm that eventually ruined the show for a chunk of its ticketholders. The local segment of the show was hosted by the DJ duo of AssJamz. Many fans may remember them for their marathon set at the last Uzi concert. On this day, they spun 2000s pop rap and other fan favorites, keeping the early crowd in as lively a mood as possible.